If you have a video that is longer then 15 minutes, it might be a good idea to have an audio file (mp3) of it as well, so that people can download it and listen while running errands. 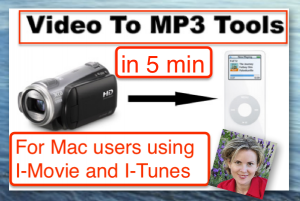 Jane Orlov shows how to extract audio file from video using I-movie program on mac and also how to turn wav audio file to a more compact size mp3 file using I-Tunes on mac. Ever watch 1 hour webinar and wonder I wish they had an mp3 version of it, so that I could download it to my phone and listen while running errands….. Or you created a webinar and want more people to get your information, then offer an mp3 downloadable version of it to your audience…. and if you have a map computer you can learn it from me after watching my SUPER valuable 5 minute tutorial, which took me many hours and hours of watching tutorials and on the phone with apple support to learn!!!!! Now you can have it for free….